Spoilers! 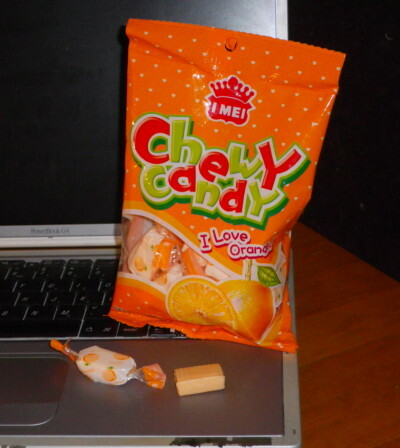 Here is the orange flavor of Chewy Candy, I love Orange!!. Like the Strawberry of yesterday and the Lemon of ought eight, these are a rectangular bit of taffy like pleasantness. Unlike the Strawberry, though, Orange doesn’t seem to promise the olfactory world in fruitness. In fact, I can’t smell anything over my “fragrance free” hand lotion so there’s not a lot of orange aroma flitting about. This doesn’t mean there isn’t a lot of orange taste because there is indeed a rather pleasant orangeness as well as a creaminess to them. The two combine to create an almost orange creamsicle flavor and I love orange creamsicle (!!). There could be a little more citrus tart if you want to get all fruit flavored technical on these Chewy Candies but you know what? Creamsicle wr0cks. There is enough mellow and sweet orangy to do the flavor justice, even if it’s still a bit of a walk to get to “from the tree orange”. I also am digging the creamsicle nature of these which is nice and refreshing. The ubiquitous Asian bouncy taffy syndrome is not as pronounced in Orange which makes me even happier. Plus, there is the pretty wrapping which is pastel orange and white this go around. In the landscape of Chewy Candy, these are every bit as tasty as the Lemon.